Neutrophils are critical in the defense against potentially harmful microorganisms, but their excessive and inappropriate activation can contribute significantly to tissue damage and a worsening pathology. Through the release of endocrine factors submandibular glands contribute to achieving a balance in neutrophil function by modulating the state of activation and migratory potential of circulating neutrophils. A putative hormonal candidate for these effects on neutrophils was identified as a heptapeptide named submandibular gland peptide T (SGP-T; sequence = TDIFEGG). 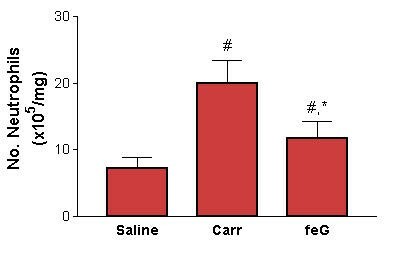 Since the tripeptide FEG, derived from SGP-T, and its D-amino acid analogue feG had similar inhibitory effects on inflammatory reactions, we investigated the effects of feG on human and rat neutrophil function. With human neutrophils feG had no discernible effect on oxidative burst or phagocytosis, but in picomolar amounts it reduced PAF-induced neutrophil movement and adhesion, and the binding of CD11b by 34% and that of CD16b close to control values. In the rat feG (10-11M) reduced the binding of CD11b and CD16 antibodies to PAF-stimulated circulating neutrophils by 35% and 43%, respectively, and at 100 micrograms/kilograms intraperitoneally feG reduced neutrophil in vivo migration by 40%. With ovalbumin-sensitized rats that were challenged with antigen, feG inhibited binding of antibodies against CD16b but not CD11b, on peritoneal leukocytes. The inhibitory effect of feG on neutrophil movement may be mediated by alterations in the co-stimulatory molecules CD11b and CD16. The VCS-1 gene encodes a multipotent prohormone as a 146 amino acid protein named SMR1 . From proximal N-terminal dibasic cleavage sites a pentapeptide, QHNPR, is generated that is involved in the modulation of mineral balance , whereas from the carboxyl-terminus a 7 amino acid peptide (TDIFEGG; SGP-T) is an inhibitor of endotoxic hypotension  and intestinal anaphylaxis . This heptapeptide can be shortened to a biologically active pentapeptide (FEGGG) or tripeptide (FEG) . The conversion of the tripeptide into its D-isomeric form (feG) favors its oral administration, yielding a significant reduction in anaphylactic responses of the intestine, heart and lungs [5, 6]. The anti-inflammatory effects of these salivary gland peptides have been postulated in animal models to be due to the inhibitory effects on neutrophil chemotaxis [7, 8] and leukocyte rolling , although relatively little is known of the effects of these peptides on human neutrophils. Neutrophils participate in the first line of defense against potentially harmful microorganisms [10, 11], but they also contribute to the underlying pathology associated with acute lung , ischemia-reperfusion  and burn  injuries, arthritis , and allergic reactions [16, 17]. The repertoire of defense mechanisms deployed by the neutrophil includes production of reactive oxygen species, proteolytic enzymes, and bactericidal peptides [10, 11], that can contribute significantly to tissue damage and subsequent pathology over and above that caused by the original infection or injury. Therefore, the modulation of neutrophil activities constitutes an approach to regulate inflammatory responses, with the desired effect being a balance between the protective and tissue repair properties of neutrophils and their tissue destroying potential. The SMR1 C-terminal peptides possibly represent hormones whose primary functions are to down regulate leukocyte function, but not to the extent that they suppress innate immune function and compromise their protective role in disease [18, 19]. In this study we examined the effects of feG on several human neutrophil functions, and correlated these with the actions of feG on inflammatory events in rodents. The results suggest that feG, through actions on CD11b and CD16, exerts its anti-inflammatory effects by modulating primarily neutrophil adhesion and migratory responses while leaving other neutrophil functions unaltered. Between 10 to 25% of the neutrophils added to the Costar upper chamber migrated into the bottom chamber in response to 10-9M PAF. The effects of different doses of feG on the migration of human neutrophils were examined over a 2 h period (Figure 1). feG, at doses ranging from 10-11M to 10-9M, inhibited by 30 to 40% neutrophil migration elicited by PAF (10-9M). At doses outside this range the inhibitory effect was absent, resulting in a bell-shaped dose-response relationship. feG and neutrophil migration. The dose response relationship for feG inhibition of PAF (10-9M) induced neutrophil migration. (mean ± SEM; n = 3–7). Statistically significant differences (*P < 0.05) between the indicated values and the inhibition seen in absence of peptide. The effect of feG, in the dose range of 10-12M to 10-8M, on neutrophil adhesion to gelatin coated slides was evaluated. Under basal conditions and after 30 min of incubation, approximately 7.6 ± 1.1% of the added neutrophils adhered firmly, and this basal adhesion was not altered by feG (Figure 2A). If the neutrophils were stimulated with 10-9M PAF, just prior to adding the neutrophils to the slides, adhesion increased by 64% from basal to 12.4 ± 1.4%, and feG at 10-11M and 10-10M inhibited neutrophil adhesion by 36% and 27%, respectively (Figure 2B). In another study we found that feG (10-9M) inhibited by 61.8 ± 17.7% (n = 3) eosinophil binding to gelatin, while having no effect on the binding of these cells to fibronectin (5.7 ± 7.1% inhibition; n = 5). feG and neutrophil adhesion. Effects of feG on neutrophil adhesion. A. feG did not affect the basal adhesion of neutrophils to gelatin. B. 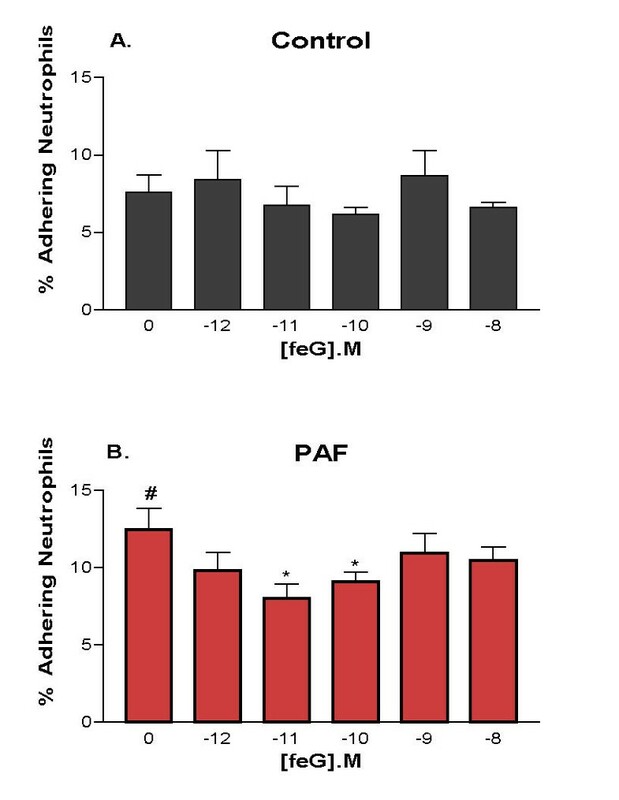 At doses of 10-11M and 10-10M feG inhibited neutrophil adhesion to gelatin induced by 10-9M PAF. (mean ± SEM; n = 5). Statistically significant differences (P < 0.05): # greater than Control in panel (A); * less than no peptide. Through the release of superoxide and enzymes and by phagocytosis, neutrophils inactivate and destroy virulent pathogens . The effects of feG on these functions were evaluated. Basal release of superoxide was 17.0 ± 2.9 7 μmoles/107 cells/min, and in response to PAF (10-9M) human neutrophils generated 60.6 ± 8.7 μmoles of O2/107 cells/min. In the dose ranges of 10-8M to 10-12M feG superoxide production remained unchanged (54.1 ± 6.7 μmoles of O2/107 cells/min with 10-11M feG). feG did not alter phagocytosis of opsonized S. aureus (not shown). The effect of feG on the binding of antibodies to cell surface markers that are related to cell migration and adhesion were examined. Of the several adhesion molecules responsible for neutrophil adhesion, rolling and transcellular migration, we examined CD11b initially. PAF (10-9M) increased the binding of CD11b antibody to neutrophils from a basal MFI, with untreated cells at 37°C, from 148.1 ± 12.8 to 291.6 ± 14.1. Incubating the neutrophils with feG alone did not affect binding of CD11b antibody, however if PAF was added to feG incubated cells small, but significant, reductions in CD11b antibody binding of 12%, 17% and 15% occurred with 10-10M, 10-11M and 10-12M feG, respectively (Figure 3A). These modest inhibitory effects actually reflect the inclusion of basal antibody binding (see Figure 4A; control histogram) that is not affected by feG. 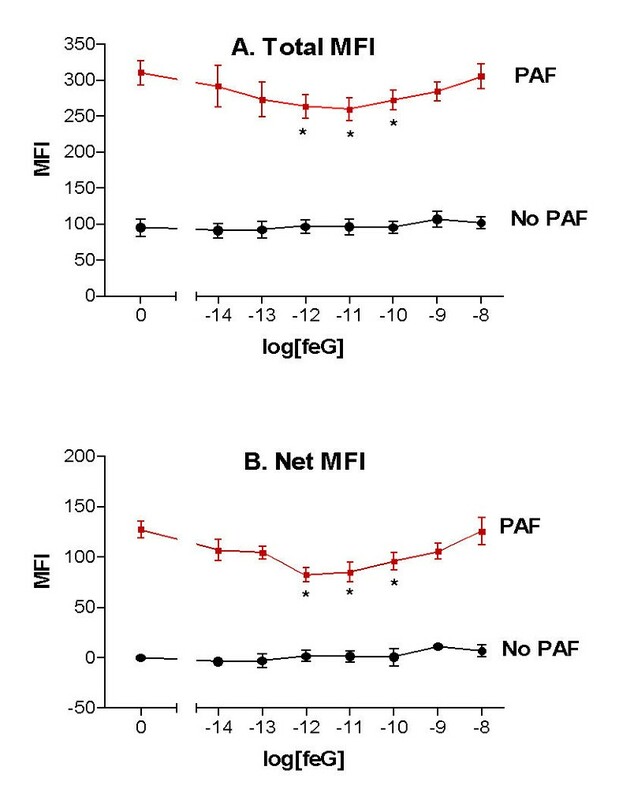 This basal, control binding was subtracted from the total MFI values to yield a net change in MFI (Net MFI). With this transformation (Figure 3B) the inhibitory effects of feG on antibody binding were 25%, 34% and 35% for 10-10M, 10-11M and 10-12M feG, respectively, which fell off to an insignificant inhibition of 16% and 10% for 10-13M and 10-9M feG, respectively. 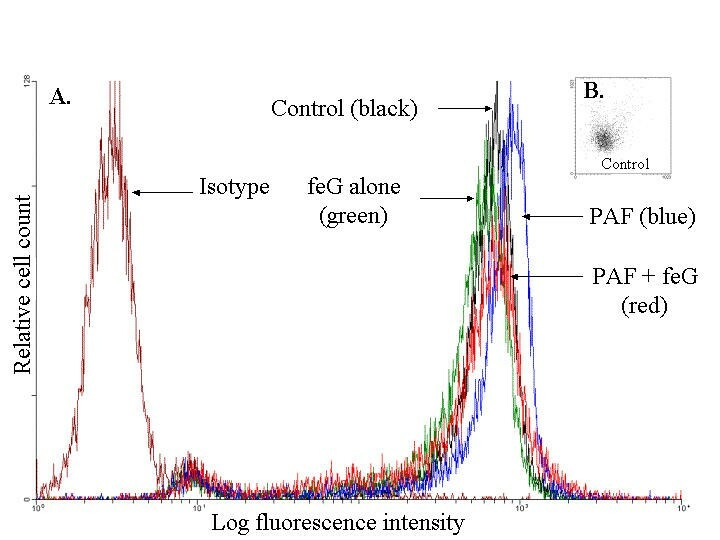 The histograms, in Figure 4A, show the increase in fluorescence intensity over the control responses upon the addition of PAF, as well as the inhibitory effect of feG on PAF enhancement of CD11b antibody binding. The neutrophils were a homogeneous cell population as assessed by forward and side-light scatter shown in the dot plot (Figure 4B). feG and CD11b antibody binding to human neutrophils. Effects of feG on basal and PAF (10-9M) induced binding of CD11b antibody (mean ± SEM; n = 6). A. Total MFI is plotted against dose of feG. B. Net MFI (total MFI-control MFI in absence of PAF) is plotted against dose of feG. Statistically significant differences (*P < 0.05) from no peptide (0). FACS analysis of CD11b antibody binding to isolated human blood neutrophils. A. Histograms of relative cell count for Isotype control (irrelevant, species-matched IgM antibody), and CD11b antibody (mouse anti-human IgG1, VIM 12 clone) for Control (no additions), PAF alone (10-9M), feG alone (10-11M) and feG in the presence of PAF. PAF increases fluorescence intensity relative to Control, and feG decreases the fluorescence intensity. Histograms are representative tracings. B. Dot plot of cell sample treated with 10-9M PAF showing homogenous nature of the isolated neutrophils. The dot plot is representative of cell samples for Control and feG treated cells. Several other cell adhesion molecules on neutrophils were examined (Table 1). feG did not alter the basal binding of these antibodies. PAF (10-9M) elicited significant increases in antibody binding for CD11b (97%) and CD14 (88%), and decreases for CD43 (-52%) and CD62L (-53%). With PAF activated neutrophils, feG treatment decreased binding of antibodies for CD11b (17% at 10-11M), and CD16b (33% at 10-11M), and when basal control binding was subtracted (Net MFI) the decreases were 34% and 164%, respectively. 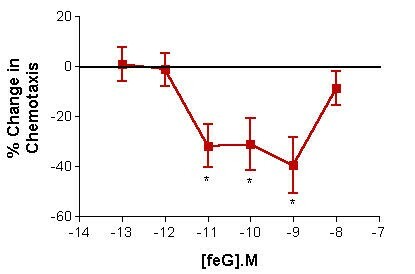 The greater than 100% reduction of MFI for CD16b reflects that reduction by feG of MFI values below those of the control obtained in the absence of PAF or peptide, as illustrated in the histograms in Figure 5. Several other markers on human neutrophils were not affected by feG, and these include CD11a, CD11c, CD14, CD18, CD43, CD62L, CD87 and CD162 (Table 1). FACS analysis of CD16b antibody binding to isolated human blood eutrophils. A. Histograms of relative cell count for Isotype control (irrelevant, species-matched IgG antibody), and CD16b antibody (mouse anti-human IgMκ; 1D3 clone) for Control (no additions), PAF alone (10-9M), feG alone (10-11M) and feG in the presence of PAF. 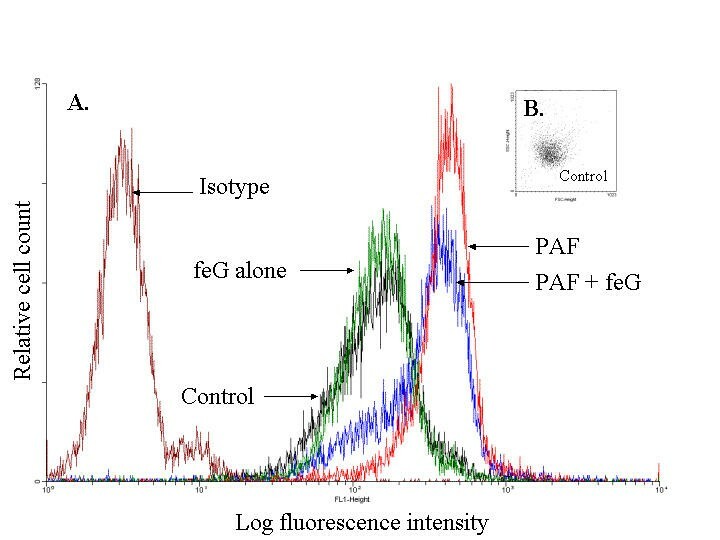 PAF only modestly increases fluorescence intensity relative to Control, and feG decreases the fluorescence intensity below those seen in Control. Histograms are representative tracings. B. Dot plot of cell sample treated with 10-9M PAF showing homogenous nature of the isolated neutrophils. The dot plot is representative of cell samples for Control and feG treated cells. Effects of feG on the binding of antibodies to cell adhesion and associated molecules in PAF-stimulated cells. 1Concentration of feG = 10-11M. 2 Values expressed as mean ± SEM of Mean Fluorescence Intensity for n = 4–14. 3 Percent change between PAF and PAF & feG. 4 Percent change after subtraction of Control MFI from that of PAF and PAF & feG (Net MFI). Significance (P < 0.05): # greater than Control; * = less than PAF alone; † less than Control. feG's inhibitory effects on binding of CD11b and CD16b antibodies occurred only if the neutrophils were stimulated with PAF, since the peptide had no effect on the binding of these antibodies on neutrophils stimulated with IL-8, LTB4, C5a (ZAP) or TNF (Table 2). Of these alternative stimulants, only IL-8 and C5a increased binding of CD11b antibody, and none altered the binding of CD16b antibody. Furthermore, the inhibitory effects on CD11b and CD16b antibody binding were specific for feG, since the inhibition was absent with N- and C-terminally blocked analogues, i.e. amino-terminal acetylation and carboxyl-terminal amidation (Table 3). Furthermore, the tripeptide feA, which was ineffective in reducing antigen-induced contractions of rat sensitized ileum, a hallmark of feG biological activity , did not affect antibody binding to CD11b and CD16b. Effects of various inflammatory agents on the binding of CD11b antibody to human neutrophils. 1Concentration of feG = 10-11M. 2Concentrations of stimulants: PAF = 10-9M; IL-8 = 10-9M; LTB4 = 10-9M; C5a = 1%; TNF = 5ng/ml. 3 Values expressed as mean ± SEM for n = 3–11. Significance (P < 0.05): # greater than Control; * less than Stimulant alone. feG inhibition of antibody binding to CD11b and CD16b requires free N-terminal amide and C-terminal carboxyl groups. 1Concentrations of peptides = 10-11M. 2 Values of Mean Fluorescence Intensity expressed as mean ± SEM for n = 4–7. Significance: * less than PAF alone. The reduction by feG of antibody binding for CD11b and CD16b could be due to several factors which include, preventing the mobilization of granule-stored intracellular molecules, promoting their shedding from the cell surface, or altering antibody binding without affecting the amount of CD11b or CD16b expressed on the cell membrane. We initially examined if the decrease in binding of CD11b and CD16b antibodies was also observed with intracellular as well as cell surface localized molecules. An increase in the binding of the isotype antibody from 19.8 ± 2.9 to 42.7 ± 7.5 MFI units was seen when the cells were fixed, although fixation did not affect basal and PAF-stimulated binding of CD11b, with relative MFI for fixed to non-fixed cells being 104% and 80% of control values, respectively. In contrast, fixation markedly reduced the binding of CD16b antibody with basal and PAF-stimulated binding of the antibody to fixed cells being only 35% and 27% of that seen in non-fixed cells. Consequently, only the effect of feG on intracellular CD11b was evaluated. Figure 6 shows that feG reduced binding of CD11b antibody to the cell surface, whereas binding to the internal pool of this marker was not altered. This result implies that feG alters primarily the binding of antibody to CD11b molecules located on the surface of cells. feG and intracellular CD11b. Binding of CD11b antibody to membrane (external) and granular (internal) pools of neutrophils was determined in untreated controls (black columns), and in the presence of PAF alone (red columns), or PAF and feG (10-11M) (blue columns). Results are presented as mean ± SEM (n = 6) of MFI for CD11b. Statistically significant differences (P < 0.05): # greater than control; * less than PAF. The suggestion that feG alters antibody binding was supported, at least for CD16b, by the observation that the binding of a second CD16b antibody (LNK16 clone) was not modified by feG, in contrast to the dose-dependent decrease in binding of the 1D3 clone antibody (Figure 7). Since the LNK16:IgG1 isotype ratio was not modified by feG it appears that the peptide does not affect the amount of CD16b on the surface of the neutrophil. feG may alter the binding of the 1D3 antibody, by causing a change in conformation of CD16b with obscuration of the binding epitope for this antibody, but not for the LNK16 antibody. feG and the binding of different antibodies to CD16b. The dose response relationship for the binding of two different antibodies against CD16b, the 1D3 and LNK16 clones, to human neutrophils. The percent change in MFI relative to PAF (10-9M) is plotted against dose of feG. Data presented as mean ± SEM for n = 6–8. Statistically significant differences (*P < 0.05) from no peptide (0). Since feG was synthesized based on the sequence of a rat peptide , but has potent activities on human neutrophils, we also examined the effects of this peptide on circulating rat neutrophils. feG at concentrations from 10-11M to 10-10M inhibited the binding of CD11b antibody to rat neutrophils (Figure 8). With CD16 feG also gave the bell-shaped dose-dependent inhibition (10-12M to 10-10M) of antibody binding to isolated rat neutrophils. feG and binding of CD11b and CD16 antibodies to rat neutrophils. A dose response relationship for the inhibition by feG of the binding of CD11b and CD16 antibodies to PAF (10-9M) stimulated rat neutrophils (mean ± SEM; n = 6). The percent change in MFI relative to PAF (10-9M) is plotted against dose of feG. Statistically significant differences (*P < 0.05) from PAF in the absence of peptide. A dose of 100 μg/kg of feG was used for these in vivo investigations since we had shown previously that this dose provided optimal inhibition of allergic reactions in rats . Neutrophils were the exclusive cell recovered from carrageenan soaked sponges. The cells were >98% viable as determined by Trypan-blue exclusion. Addition of carrageenan to the sponge increased neutrophil counts by approximately 3 fold from 7.2 ± 1.6 (× 105) to 20.0 ± 3.7 (× 105) cells/mg of sponge (Figure 9). Treatment of rats with 100 μg/kg of intraperitoneal feG significantly reduced by 42% to 11.7 ± 2.6 (× 105) neutrophils/mg of sponge. Chemotaxis of rat neutrophils. Inhibition of the accumulation of neutrophils into a subcutaneously implanted carrageenan (Carr)-soaked sponge by 100 μg/kg of feG administered intraperitoneally. (mean ± SEM; n = 6–10). Statistically significant differences (P < 0.05): # greater than control; * less than Carr. 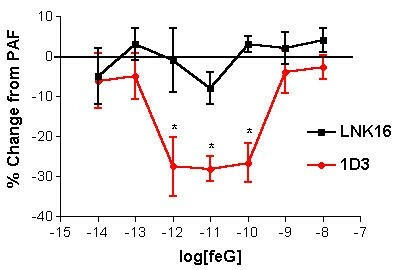 To investigate if a functional correlation exists between the effects of feG on CD11b and CD16 during an inflammation, these molecules were measured on blood and peritoneal neutrophils isolated from ovalbumin-sensitized rats that had been challenged with antigen after being treated with feG (100 μg/kg, per os). Basal binding of CD11b to peritoneal and blood neutrophils, expressed as MFI, was 1342 ± 102 and 367 ± 46, respectively (Figure 10A). The peptide feG reduced basal binding of CD11b to 896 ± 183 and 158 ± 29 for the peritoneal and blood neutrophils, respectively. The binding of CD11b on blood cells was increased 1.8 fold by the antigen, whereas on peritoneal cells the increase was only 1.2 fold. The inhibitory effect of feG, seen on the binding of CD11b under basal conditions for both circulating and peritoneal cells, was not observed in rats that received an antigen challenge 24 h previously. CD11b and CD16b antibody binding to rat neutrophils. 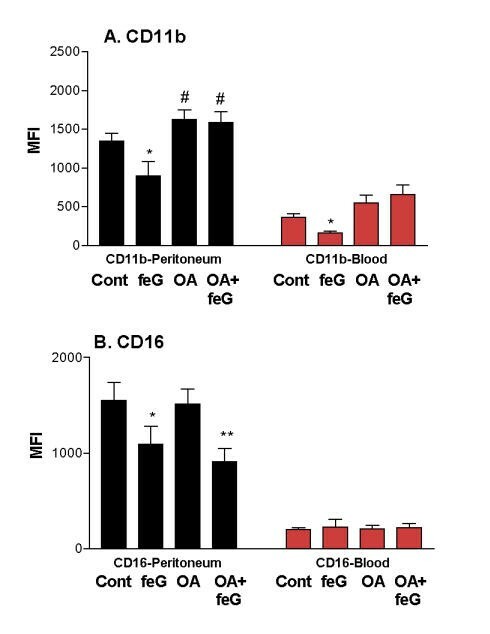 Effect of feG on the binding of CD11b (A) and CD16 (B) antibodies to rat peritoneal (black bars) and blood (red bars) neutrophils. (mean ± SEM; n = 4–7). Four groups of ovalbumin (OA)-sensitized rats were used: unchallenged and saline treated (Cont), unchallenged and feG-treated (feG), challenged and saline-treated (OA), and challenged and feG-treated (OA+feG). Statistically significant differences (P < 0.05) where # indicates greater than OA-challenged and * indicates less than Cont, and ** less than OA. 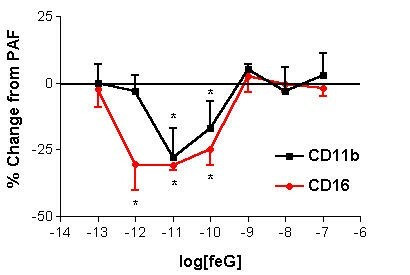 With blood neutrophils, CD16 binding was not affected by feG or by antigen challenge (Figure 10B). The 30% reduction of basal MFI for CD16b from 1552 ± 188 in controls to 1092 ± 187 in feG-treated rats was maintained in OA-exposed animals, with MFI in these challenged rats being 1513 ± 158 in controls and 914 ± 134 in feG-treated rats. The critical role played by neutrophils in controlling infections and other inflammation, can lead to unwanted collateral damage to adjacent cells and tissues. Thus, neutrophil activity needs to be rigorously controlled. The regulatory mechanisms, which for the most part are mediated through cell surface membrane receptors, utilize a variety of juxtacrine, paracrine, and endocrine systems . Some of the paracrine mechanisms involve mediators emanating from the circulation (complement, catecholamines, GM-CSF) and released from other immune cells, (LTB4, PAF and TNF), or involve juxtacrine mechanisms such as regulation of expression and affinity of counter adhesion receptors, such as ICAM-1, on endothelial cells . Although some of the major endocrine influences on neutrophil function are catecholamines and glucocorticoids, the current study supports a previous suggestion  that hormones, elaborated in an exocrine/endocrine submandibular gland, also are potent modulators of neutrophil function. This ability of salivary gland peptides to modify neutrophil function has important implications for both oral and systemic health, because unregulated neutrophil function can lead to serious problems with the soft tissues of the mouth resulting in gingivitis , and can contribute to ulcerous mucosal lesions in the stomach . Factors of salivary gland origin, such as NGF promote neutrophil chemotaxis, phagocytosis, superoxide production and survival [24–28]. Another factor, endothelial-monocyte-activating polypeptide-II, released from salivary glands promotes monocyte endothelial cell interactions . The SMR1 C-terminal peptides, of which feG is an example analogue, through their anti-migratory (Figures 1 &9) and anti-adhesive properties (Figures 2), may act to counter-balance and modulate the pro-inflammatory factors elaborated by these glands. Unlike NGF, which promotes numerous neutrophil functions, the actions of feG are limited to cell migration and adhesion, as superoxide production and phagocytosis were not affected. It should be noted that the heptapeptide SGP-T reduced superoxide production by human neutrophils , although this inhibitory activity was not shared with the truncated D-isomeric peptide. Thus, rather than being an overall suppressive agent, feG's effects on inflammation are limited to restricting neutrophil recruitment into a site of inflammation. This mode of action would permit the anti-inflammatory activity of neutrophils to proceed, but reduces collateral cell and tissue damage by restricting the number of activated neutrophils participating in the inflammatory response. Limiting neutrophil accumulation has important implications in the treatment of asthma , intestinal allergy  and possibly other inflammatory disorders. feG may potentially be useful in counteracting some undesirable side effects of steroids in asthmatics. High dose steroids in severe asthmatic patients do not alleviate airway neutrophilia, and paradoxically corticosteroids enhance neutrophil survival and exacerbate neutrophil activity, possibly leading to unwanted effects of the steroids in asthmatic patients . Since the inhibition of neutrophil function by feG is only partial, generally in the range of 30–40% and limited to PAF-activated cells, it is possible that the peptide may act on a subpopulation of circulating neutrophils which have a spectrum of ages and history of prior activation or priming by chemotaxins or cytokines [30, 31]. Further studies are required to verify this hypothesis or whether, alternatively, feG acts on only one arm of a multi-pathway for cell activation used by PAF . The mechanism employed by feG to inhibit neutrophil function is unknown, although regulation of cell adhesion molecules or accessory molecules appear to be involved, in particular CD11b and CD16b (Table 1; Figures 3 and 7). CD16b is discussed in more detail below. Several important features of feG's actions relate to its actions on the αβ2-integrins. The CD11 isoforms, dimerize with CD18  to form αLβ2-integrin (LFA-1; CD11a/CD18), αMβ2-integrin (Mac-1; CD11b/CD18) and αXβ2-integrin (p150, 95; CD11c/CD18). These heterodimers are important to neutrophil binding and the inflammatory process [34–36]. Since feG affects CD11b and has no effect on CD11a, CD11c or CD18, it appears that the peptide affects predominately the binding of CD11b antibody rather than promoting a loss of this integrin from the cell. This altered antibody binding may reflect reduced affinity of CD11b for its counter and accessory receptors. A second point related to feG's actions αβ2-integrins is the specificity shown for PAF stimulation. Stimuli, such as PAF, LTB4, IL-8 and C5a activate neutrophils via attachment to specific receptors on the cell surface , and elicit an increase in antibody binding to αM- and/or β1-integrins on neutrophils (Table 2; and [37–41]). TNF does not activate neutrophil functions directly, but rather acts as a priming agent for chemotactic and proadhesive functions [42, 43], and this cytokine does not modify CD11b expression (Table 2). The firm adhesion of rolling neutrophils on inflamed endothelium is dependent on β2 (CD18)-integrins, with CD11a/CD18 being more important than CD11b/CD18 in neutrophil emigration at inflammatory sites as elicited by IL-8 and LTB4 [41, 42]. CD11a and CD11c are expressed at lower levels on circulating human neutrophils than CD11b (Table 2). Other cell adhesion molecules, such as CD43, L-selectin (CD62L) and CD162, which participate in neutrophil adhesion and movement [44–46], were not explored further since feG did not modify binding of these antibodies to neutrophils (Table 1). Other plasma membrane receptors, and in particular the glycosylphosphatidylinositol (GPI)-anchored protein FcγRIIIB (CD16b), are absolutely required for chemotaxis of human neutrophils . This activity of CD16b is explained, at least in part, by its ability to physically interact with CD11b [48, 49] to form a functional complex [50, 51]. The activation of chemotaxis, at least by fMLP, is also associated with an up regulation and eventual shedding of CD16b . Our studies indicate that PAF effects may be the consequence of a CD11b-CD16b relationship, since the increased binding of antibodies to both of these proteins by the lipid mediator was prevented by feG (Table 1; Figures 3 &7). The differential regulation by feG of 1D3 and LNK16 binding indicates that the peptide, in some manner, alters the conformation of CD16b such that the binding of 1D3 is reduced whereas that of LNK16 is not affected. This conclusion is supported by the observation that these two antibodies have distinct binding epitopes on CD16b. LNK16 binds to C'β-sheet region of CD16b which is located in the membrane-proximal domain, whereas 1D3 binds to more distal FG loop , which composes the major binding determinant on this receptor. By altering FG loop conformation feG may reduce the dimeric association of CD16b and CD11b. Another GPI-linked protein, CD87 interacts with plasma membrane integrins (β1, β2 and β3) in various cell types , but does not participate in the actions of feG since the peptide did not modify antibody binding to this marker. With rats feG reduced neutrophil migration (Figure 9) and the expression of CD11b and CD16 on neutrophils (Figure 8), even though rat CD16 has a transmembrane domain like human CD16a, and is not GPI-linked . However, a direct relationship between CD11b and CD16, at least in terms of modulating the binding of antibodies to these markers on rat neutrophils, is questioned by the dissociation of feG effects on the binding of CD11b and CD16 antibodies to rat neutrophils obtained from allergen-challenged rats (Figure 10). Aside from species differences this dissociation of feG effects on the binding of CD11b and CD16 antibodies could reflect phenotypic changes in the cells following antigen challenge. Nonetheless, even in the absence of an effect of feG on neutrophil CD11b obtained from OA-challenged animals, the observed change in CD16 suggests that the IgG-receptor is an important participant in feG regulation of neutrophil function after exposure to allergen. This study has established that the tripeptide feG, a derivative of a 7 amino acid anti-inflammatory peptide isolated from salivary glands of rats, is a potent (picomolar) inhibitor of neutrophil movement and chemotaxis on human and rat neutrophils. feG reduces the binding of CD11b and CD16b antibodies to neutrophils, and may exerts its anti-inflammatory effects by modifying the activity of these molecules resulting in impaired neutrophil migration into a site of inflammation. feG may have utility in modulating the severity of a variety of inflammatory conditions. Unless otherwise specified all antibodies were against human proteins. The following antibodies were used: anti-rat CD11b (clone WT.5; Pharmingen, San Diego, CA); CD11a (clone MEM-25; mouse IgG1; Caltag, Burlingame, CA); CD11b (clone VIM 12; mouse IgG1; Caltag); CD11c (clone BU15; mouse IgG1; Caltag); CD16, (clone B-E16; mouse IgG1; Medicore, Montreal, QC); CD16b (clone 1D3; mouse IgMκ; Beckman Coulter Canada Inc., Mississauga, ON); CD16 (clone LNK16; mouse IgG1; Advanced ImmunoChemical Inc, Long Beach, CA); CD18 (clone L130, mouse IgG1; Pharmingen); CD87 (clone VIM5; mouse IgG1; Pharmingen); CD162 (PSGL-1, P-selectin glycoprotein ligand-1; clone KPL-1; Mouse IgG1κ, Pharmingen); affinity purified FITC goat anti-mouse IgG (ESBE). Products obtained from Sigma Chemicals Inc. (St. Louis, MI) were: aluminum hydroxide (Al(OH)3); bovine serum albumin (BSA); cytochrome C; superoxide dismutase; ovalbumin (OA); Coomassie Brilliant Blue R250; platelet activating factor (PAF); phorbol myristate acetate (PMA); N-formyl-methionyl-leucyl-phenylalanine (fMLP); paraformaldehyde. Other products used were: fetal bovine serum (FBS) (Cansera International Inc., Toronto, ON), tumour necrosis factor (TNF) and interleukin-8 (IL-8) (Research Diagnostics Inc.,Flandere,NJ); HTMT dimaleate (6-[2-(4-Imidazolyl)ethylamino]-N-(4-trifluoromethylphenyl)-heptanecarboxamide) (Tocris Cookson Inc., Ellisville, MO), and Hanks' balanced salt solution (HBSS; Gibco BRL, Grand Island, NY). Core Laboratories, Queens University, Kingston, ON synthesized feG. Its composition was verified by amino acid analysis. Phosphate buffered saline (PBS) had the following composition (mM): NaCl (137), KCl (2.7), Na2HPO4 (8.1), KH2PO4 (1.47), CaCl2 (1.19,) MgCl2 (0.54), glucose (7.5). The chemoattractant (PAF at 10-9M) was prepared immediately prior to use with glass tubes and Hamilton syringes to its final concentration in HBSS containing 0.1% BSA. Neutrophils were isolated from the blood of normal healthy volunteers as described previously . The blood (20 mL) was collected onto 4 mL acid citrate dextrose (ACD; 22.0 g/L trisodium citrate, 8.0 g/l citric acid, 24.5 g/l dextrose) as an anti-coagulant. The erythrocytes were sedimented with dextran (6% dextran in 0.9% NaCl; 10 mL/20 mL blood) and the remaining red blood cells in the plasma were subjected to a 5 min cold lysis using 155 mM NH4Cl, 10 mM KHCO3, 1 mM disodium EDTA, pH 7.4. The cells were then centrifuged at 150 g for 12 min in a Beckman J6-MC using a JS 4.2 Rotor. The supernatant was discarded and the pellet was resuspended in cold lysis buffer and washed in PBS. Granulocytes were then isolated using Ficoll separation to a purity of >98% as determined by differential staining with Geimsa-Wright stain. The cells were stored on ice until just before use, at which point they were spun and resuspended at a final concentration of 107 cells/mL in HBSS. Neutrophil viability, assessed by Trypan blue exclusion, was >97%. Neutrophils were preincubated at room temperature with peptides in doses ranging from 10-7 to 10-14M for 5 min (unless otherwise indicated) prior to adding stimulating agents for 10 min at 37°C. Stimulants and concentrations used, which were optimized in preliminary experiments, were: PAF (10-9M), IL-8 (10-9M), TNF (5 ng/mL), or LTB4(10-9M). Neutrophils were centrifuged at 200 g for 6 min at 4°C. The supernatant was decanted and 50 μl of antibody, at the appropriate dilution, added to the pellet followed by gentle vortexing. The appropriate isotype controls were prepared. The neutrophils were incubated with antibody for 30 min at 4°C in the dark. Following this incubation 1 mL of cold PBS was added and the cells centrifuged at 180 g for 6 min at 4°C. The supernatant was decanted carefully, and 300 μL of PBS added to the neutrophils, which were then read with a Fluorescence Activated Cell Sorter (FACS; BD Biosciences, Lexington KY). The effects of the peptides on the binding of antibodies to cell surface molecules were evaluated by determining the changes in mean fluorescence intensity (MFI) of cells incubated in the presence of peptide and PAF and those incubated in the presence of PAF alone, after subtracting the background (Control; MFI expressed in cells incubated in absence of PAF and peptide). Neutrophils were kept at 4°C in calcium and magnesium free PBS at 1 × 107 cells/mL. Immediately prior to use the neutrophils were diluted to 2.5 × 106 cells/mL, and aliquoted to 500 μL Eppendorf microfuge tubes and the appropriate amount of peptide was added for incubation at room temperature for 5 min. After this preincubation 500 μL HBSS was added to the cells and the tube mixed gently. Chemotaxis was performed with Costar plates (Corning Life Sciences, Acton MA) that were coated previously with 1% gelatin in PBS (inserts – 200 μl and wells – 800 μl) for at least 1 h at 37°C. A volume of 1.3 mL of chemoattractant was added to the bottom well and 400 μl of cell suspension to the inserts. The inserts were placed carefully into the wells, making sure no air bubbles were trapped between the insert and the chemoattractant. The plates were then incubated at 37°C for 1 h to allow cell migration to occur. Upon removal of the plates from the incubator, they were gently shaken from side to side to dislodge any cells adherent to the bottom of the insert. The insert was then discarded and 1.2 mL of 2% Phosphate Buffered Formalin was added to each well. After a 10 min fixation at 4°C, the plates were centrifuged at 300 g for 10 min and the supernatant was then discarded. The cells were resuspended in 300 μL of PBS buffer and counted on a hemocytometer. Neutrophils (106) were suspended in PBS containing 1.5 mM cytochrome C and incubated at 37°C. Each sample was read along with a reference sample containing 1440 units of superoxide dismutase in a spectrophotometer (Hitachi, U200 spectrophotometer). The rate of superoxide production was determined in response to 10-9M PAF after subtracting the reference value obtained in the presence of superoxide dismutase. Phagocytosis of flourescein-labeled Staphylococcus aureus (Bioparticles; Molecular Probes, Eugene OR) was carried out according to manufacturer's instructions. The Bioparticles were opsonized with pooled human serum. Control tubes were kept at 4°C to monitor adherence of the labeled bacteria to neutrophils in the absence of uptake, while phagocytosis was performed at 37°C for 60 min. Samples were then placed immediately at 4°C and mixed with FITC quench-buffer to eliminate fluorescence from bacteria sticking to the neutrophil cell surface. The assay was performed in duplicate and analyzed by flow cytometry. Ten thousand events were counted to assess the percentage of neutrophils that had phagocytosed S. aureus and the mean fluorescence intensity (MFI) – a measure of the number of bacteria taken up per cell was determined. Data were expressed as the neutrophil phagocytic index: Phagocytic index = % phagocytic neutrophils × MFI. To visualize intracellular antigens for CD11b and CD16b antibodies, isolated neutrophils were fixed and permeabilized using a Fix & Perm Cell Permeabilization kit (Caltag). Upon completion of control (no fixation or permeabilization), fixation only and fixation and permeabilization procedures, antibody was added for 30 min at 4°C in the dark. The cells were then washed with 1 mL of cold PBS and centrifuged at 180 g for 6 min at 4°C. The supernatant was decanted carefully, and 300 μL of PBS added to the cells. MFI determined by flow cytometry. The amount of internal antigen binding sites was determined by subtracting the MFI obtained from fixation only versus fixation and permeabilization values. Isolated blood neutrophils at a concentration of 0.5 × 106 cells/mL were plated on coverslips coated with 1% gelatin. Neutrophil adhesion, performed in the presence of PAF (10-9 M), was allowed to proceed for 30 and 60 min at 37°C. Non adherent cells were rinsed off the cover slips with ice-cold HBSS and adherent cells were fixed for 5 min in 4% paraformaldehyde at room temperature, and stained with Wright's stain for counting. The University of Calgary Animal Care Committee approved all experiments in accordance with the guidelines of the Canadian Council on Animal Care. Male, Sprague-Dawley rats (Faculty of Biosciences, The University of Calgary) weighing 250–350 g were used. The rats were sensitized by intraperitoneal injection of 10 mg of OA and 10 mg of Al(OH)3 in saline as an adjuvant, and used 5 weeks after sensitization . Blood was collected by cardiac puncture into a 10 mL syringe from rats anesthetized with halothane. The blood was diluted with approximately 30 mL of PBS in a 50 mL polypropylene centrifuge tube, and spun at 300 g for 15 min at 20°C. The buffer was carefully decanted from the pellet, and the red blood cells were lysed (0.15 M NH4Cl) for 3 min at room temperature. After a second spin at 200 g for 10 min at 20°C, the supernatant was discarded and the pellet washed with PBS buffer and spun again at 200 g for 10 min at 20°C. The supernatant was then discarded and the cells resuspended in 1 mL of PBS buffer, and layered onto Ficoll-Paque and spun at 300 g for 15 min at 20°C. The neutrophil numbers were determined using Trypan Blue exclusion on a hemocytometer. Cell differentials were determined on cell smears stained with May-Grünwald-Giemsa stain. To isolate peritoneal leukocytes 10 mL of 0.9% sterile saline was injected intraperitoneally with a 20-gauge needle into halothane anesthetized rats and the abdomen massaged gently. After a clean laparotomy the peritoneal fluid (7 to 10 mL) was recovered and placed into a 50 mL polypropylene centrifuge tube and diluted to 30 mL with PBS buffer. The cells were then prepared as described for blood leukocytes. The effects of OA-sensitization and peptide treatment on the binding of CD11b and CD16 antibodies to circulating and peritoneal leukocytes were examined in three groups of rats: one group received 0.9% saline (1 μL/g) by gavage while treated rats received either 50 mg of OA, or both OA and feG (100 μg/kg) intragastrically 24 h prior to isolation of circulating and peritoneal leukocytes. The cells were prepared as described above and incubated with antibody for 30 min at 4°C in the dark. Following this incubation 1 mL of cold PBS was added and the tubes centrifuged at 180 g for 6 min at 4°C. The supernatant was decanted carefully, 300 μl of PBS added to the neutrophils and they were then read with a Fluorescence Activated Cell Sorter (FACS). Their characteristic forward and side scatter identified neutrophils. 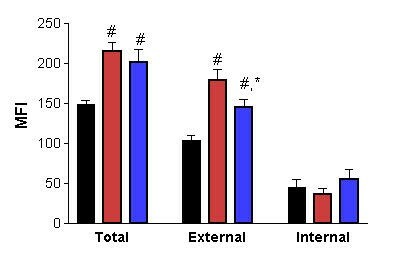 To study the chemotaxis of rat neutrophils in vivo small sponges (0.5 cm3) soaked in either 0.9% saline or 0.5% carrageenan were inserted subcutaneously in the intrascapular region of halothane anesthetized rats. To implant the sponge a 2–3 cm incision was made dorsally between the shoulder blades and connective tissue was cleared from the exposed area. The skin was then closed with sutures of 3–0 Dexon thread. Twenty-four h after implantation, and under halothane anesthesia the sponges were removed from their subcutaneous sites and the fluid they contained was squeezed into a test tube. Following centrifugation at 300 g for 10 min the exudate was decanted, the neutrophils were suspended in 4 mL of 0.9% saline, and their number determined using a Coulter Counter ZM (Beckman Coulter Canada Inc., Mississauga, ON). Results are expressed as means ± SEM, and N is the number of animals or separate isolations of human neutrophils. Statistical significance of differences between means was determined at P < 0.05 using one-way analysis of variance (ANOVA). If the F-test statistic warranted further analysis, significance between the means of two groups was determined using the Student's t-test. RM conceived and coordinated the study and drafted the manuscript. DB participated in study design, editing and preparation of the manuscript. RW particpated in the studies with human neutrophils. JD provided helpful discussion. All authors read and approved the manuscript. This study was supported by research grants from Salpep Biotechnology Inc., the Heart and Stroke Foundation of Canada, and the Canadian Institute of Health Research. The technical support of Cheryl Sank and Diane Teoh is appreciated.